walk in happy, leave happier! 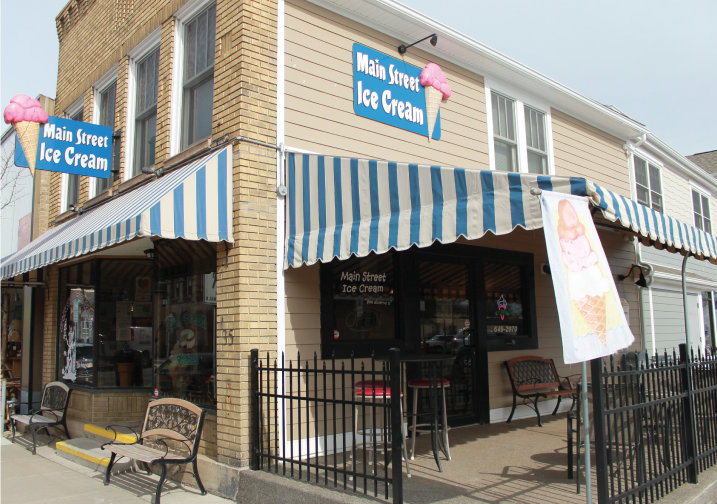 Main Street Ice Cream is home of the Two Berry Twist…a soft serve blend of black raspberry yogurt and red raspberry sherbet. We also serve soft custard, hard ice cream, shakes, sundaes, floats and lots more. We make our own waffle cones and bowls each day…plain, or dipped in chocolate and sprinkles, along with sugar or regular cones. Main Street Ice Cream has the most amazing premium sundaes: peanut butter supreme, chocolate lovers, turtle, just to name a few…one for everyone’s taste! We make our own ice cream cakes and ice cream pies in our parlor with premium ice cream custard and have great prices…a size for every occasion; from the sheet for a large party, to the mini, big enough to share with that someone special. We also make our own novelties with the freshest ingredients.